Arij Gasiunasen Fine Art, Palm Beach. Acquired from the above by the present owner (1991). U. Bode, et al., exhibition catalogue, Brusberg Dokumente 11, Fernando Botero: Das plastis che Werk, Galerie Brusberg, Hannover, 1978, no. 25 (illustrated in color). Exhibition catalogue, Fernando Botero, Washington D.C., Hirshhorn Museum and Sculpture Garden, Smithsonian Institution, 1979, p. 108, no. 65 (illustrated in color). C. Ratcliff, Botero, Abbeville Press Inc., New York, 1980, p. 198 (illustrated in color). Hannover, Galerie Brusberg, Fernando Botero: Das plastische Werk, October- November 1978, no. 25. This exhibition later traveled to Skulpturenmuseum der Stadt Marl, November- December 1978. Washington, D.C., Hirshhorn Museum and Sculpture Garden, Smithsonian Institution, Fernando Botero, December 1979- March 1980. This exhibition later traveled to Corpus Christi, Art Museum of South Texas, March- May 1980. From 1976-1977, Fernando Botero dedicated himself exclusively to sculpture. During this concentrated period of activity, Botero produced some of his most compelling three dimensional works, including Pedro on a Horse. With its rounded forms, devoid of straight lines and harsh angles, imposing size and playful use of color, Pedro on a Horse is emblematic of the Colombian artist's oeuvre. Like the many hulking beauties in Botero's canvases, little Pedro appears much too big for his hobby horse. The white toy horse balances the weight of the over life size child on its small red wheels. The expressionless young boy sits atop his blank-faced steed playing soldier as he holds the red leather reigns in one hand while brandishing his sword in the other. Botero first explored this subject three years earlier in the painting Pedro. In the earlier image, robust Pedrito, wearing a policeman's uniform, rides a piebald hobby horse inside the child's playroom surrounded by his dollhouse and toys. In the sculpture, Botero eliminates many of the details found in the painting thereby drawing attention to the boy. Pedro's carefully rendered cherubic face contrasts with his minimally modeled body and that of his mount. The boy's brilliant red lips match the brim of his hat, the reins in his hand and the wheels of his horse while his rosy cheeks correspond with his plump hands and his horse's muzzle, underscoring the unity between rider and steed. Celebrated for his vibrant palette found even in his sculptures, Botero here employs a sparing use of color. These restrained accents of color enliven but do not overwhelm this surprisingly somber work. In addition, Pedro's eyes, although they express no emotion, as is typical of Botero's work, serve to humanize this otherwise distant figure. 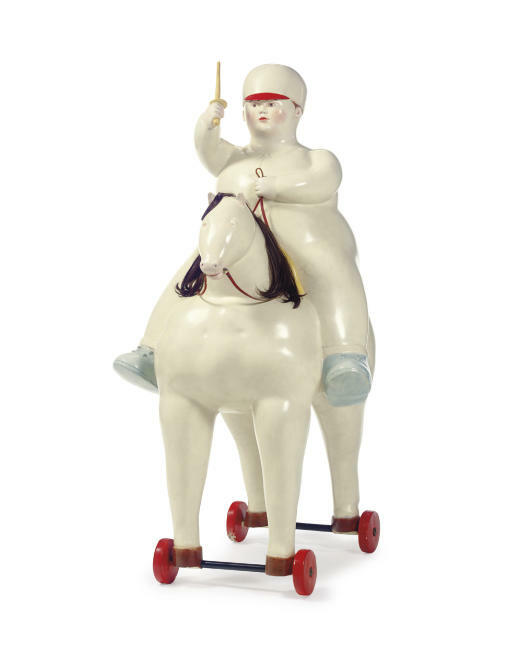 While Botero insists that his figures represent types rather than specific individuals, Pedro on a Horse does in fact refer to a particular child. (1) In 1974, Botero and his four-year old son Pedro were in a tragic car accident in Spain. Although Botero survived, enduring severe injuries, his son was killed. The loss of his son left an indelible mark not only on Botero the father but on Botero the artist as well as the image of the young boy appears in numerous paintings and sculptures after this event. What should be a lighthearted subject, a boy at play, is thus imbued with greater significance. Pedro on a Horse, however, refers to more than a poignant personal memory. With this work, Botero, a sophisticated artist and worldwide traveler, well versed in the canon of art history, evokes the tradition of memorializing powerful men with equestrian monuments. From Marcus Aurelius on the Capitoline Hill in Rome to Charles IV in Mexico City to Venezuela's great Latin American liberator Simon Bolívar, military and political leaders throughout history have been placed on pedestals and immortalized in bronze and stone. Like so many of the representations of these men, Botero depicts Pedro stoically charging forth with sword held high; thus transforming his son into the childlike equivalent of a Napoleon or Bolívar. What would seem merely an amusing sculpture, is instead a memorial of the highest honor. Moreover, Pedro on a Horse also subtly recalls the work of the French painter and sculptor Edgar Degas. Credited as one of the first artists to experiment with innovative materials in sculpture, Degas often included real hair, cloth and wire in his many wax depictions of horses and dancers. Given Botero's dedication to studying the work of a wide variety of artists, including that of the French Impressionists, it is not unlikely that he was familiar with Degas's unusual sculptural practice. Degas seems all the more plausible source of inspiration when considering that Botero was working in his Paris studio at the time he produced Pedro on a Horse. Botero's inclusion of non-traditional materials, such as the leather strap and in particular the synthetic hair used for the mane and tail of the horse, is perhaps an affirmation of the French master's influence. Pedro on a Horse thus exemplifies Botero's ability to weave complex layers of meaning into a tender and enchanting image. 1) E.J. Sullivan, Botero: Sculpture, New York, 1986, p. 55.